ink and water color; "Anibal and Martin"
In L'Arte Vetraria, Antonio Neri describes glass as "a fruit of the art of fire." He apparently liked this evocative phrase enough that he borrowed the words from an earlier volume written in the first half of the sixteenth century by Vannoccio Biringuccio. Biringuccio's De la Pirotechnia was a sort of bible for metal workers, refiners and miners. 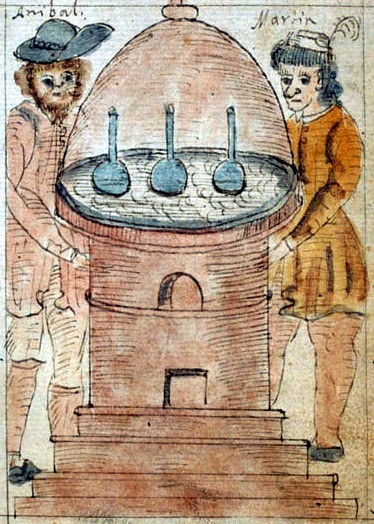 The author was in charge of an iron mine near Siena and in the late 1520's he became something of a local hero for casting cannons to help Florence defend itself in the great siege. In one sense, Neri is paying homage to his distinguished predecessor, but he is also lending a new meaning to Biringuccio's words. The mining expert's short chapter on glass is a survey and a great deal of it is spent on the debate of whether glass should be classified as a 'semi-mineral' because of its similarity to rocks and gems, or as a metal because of its molten properties in the furnace. Neri puts a different spin on the fruits of glassmaking. He is not as worried about classification as he is excited about the material's many uses. He composes a formidable list for us, one that ranges from drinking glasses, to optical lenses, to church windows, to laboratory equipment. Neri uses Biringuccio's chapter as a format for his own introduction; they both cover much of the same ground, but with a telling difference in tone. Biringuccio is very much 'old school.' His main concerns are taxonomy of the material and the construction of the equipment. For him, the finished products of glassmaking are more ornamental curiosities. He trumpets that glass objects hold more beauty than their metal counterparts, but he warns that we should not give them too much love because they are fragile and therefore, like life itself, ephemeral. Neri, on the other hand, agrees that glass can be beautiful, but he is all about the chemistry and the innovative things that can be done with this versatile material. The differences in emphasis between the two men nicely illustrate a shift that was taking place throughout society in general. For hundreds of years, the focus of scholars and craftsmen had been on rehabilitating ancient knowledge. Europeans very much saw themselves as recovering from the long slow decline of medieval times. To learn the secrets of a craft, one looked backward, not forward, and the farther back the better. Ancient texts were prized and coveted because they were seen to contain purer wisdom, uncorrupted by centuries in the dark. 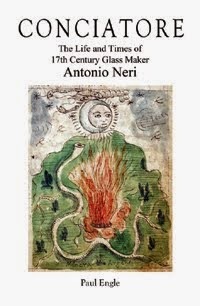 Both men discuss the ancient origins of glass, recounting that it is mentioned in the Bible and by scholars of the Roman Empire like Pliny. The difference is that Neri's gaze is turning; instead of looking back so much, his eyes are shifting to the present. Biringuccio's Pirotechnia and books like it created a platform from which Neri and his generation could then build on. There are many definitions possible for the beginning of modern science. One that is compelling from a broad, non-technical point of view is that modern science began when we spent less time looking backward for answers and more time learning from the world as it is. This post first appeared here in a slightly different form on 7 October 2013.